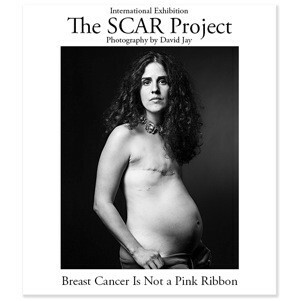 March 3, 2014—The SCAR Project, the groundbreaking photographic exhibition created by fashion photographer David Jay is set to premiere March 28 at Edward Day Gallery, 952 Queen St West, Toronto Ontario. The SCAR Project is a series of large-scale portraits of young breast cancer survivors. On the surface an awareness raising campaign for young women, The SCAR Project’s deeper message is one of humanity. Ultimately, The SCAR Project is not about breast cancer, but the human condition itself; the images transcend the disease, illuminating the scars that unite us all. Sponsored by Rethink Breast Cancer, the world-renowned exhibition will open this year’s Breast Fest on March 28, 2014. This marks the first time the exhibition will be shown to Canadian audiences. The gallery will be open for public viewing March 28-April 6 (closed Monday). Gallery hours are Tuesday-Saturday, 10:00 am – 6:00 pm, Sunday by appointment. Admission is free. A screening of the EMMY Award winning documentary about The SCAR Project: Baring It All will be shown at the Bloor Hotdocs Cinema at 3:30pm on Sunday, March 30. Tickets are $10. A Q&A session with David Jay will follow the screening. www.breastfest.ca. For more information on The SCAR Project visit the website: www.thescarproject.org and www.thescarprojectblog.com. Follow @thescarproject on Twitter and Facebook.